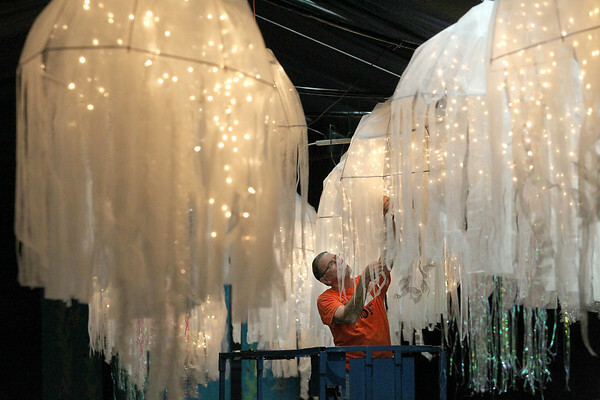 Volunteer Gary VanRaalte (cq) prepares jellyfish hung from the ceiling of the Traverse City St. Francis High School gymnasium for Friday and Saturday's 31st annual Gladhander event, which features live and silent auctions, dining, a dj and dancing to raise money for Grand Traverse Area Catholic Schools. This year's theme is "Extravaganza Earth," and will feature different environments ranging from desert and rain forest to arctic and under the sea. A preview event will be held Friday from 5:30 p.m. to 9 p.m., while the main event runs Saturday starts at 5 p.m.